Holly Davies joined Compass Associates’ Adult Social Care team in December 2016, having spent 4 years at Nottingham Trent University completing a Degree and then a Masters in Business Management and Human Resources. Holly has played an instrumental role in developing key relations with clients across the South coast region, and has most recently filled a Lead Trainer role with a well known Learning Disability provider. 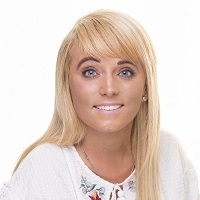 Holly’s friendly, enthusiastic and professional approach has led to many clients and candidates returning to Holly and using her services on an exclusive basis. I have found Holly to be responsive and highly organised in her dealings with my company to date. She has received a clear brief about our needs and has taken care to ensure that candidates match the key areas. She has also been very helpful with regards to making arrangements for interviews and allowing space for us to review CVs and feedback. It has been a pleasure to work with Holly as we seek to fill a key appointment and I am confident that should we need her to assist for other posts she will make sure she is as professional and efficient as she has been to date. I am looking forward to continuing our link and consider that Holly presents a very good image for Compass Associates. Our company engaged with Compass Associates during a period when our internal resources were stretched and we had several important vacancies that needed attention. Holly was assigned to work with City & County and was swiftly able to provide potential candidates that were new to our organisation. The candidates were relevant and of a high quality. During the process Holly kept in regular (but not obtrusive) contact and was a pleasure to deal with. I would have no hesitation in working with her again or recommending her and the services of Compass Associates. From the very first phone call with Holly Davies I felt extremely happy and confident with working with her to help fill any vacancies I had. Holly was very professional at all times and communication was to a very high standard. Holly has been fantastic and kept in regular contact. I would have every confidence in returning to Holly if I ever needed assistance recruiting. I have worked with Holly on at least six occasions over the past twelve months. She has been the main person I have liaised with on the recruitment of managers. She has always been responsive and professional in her approach. Her communication throughout the process has been excellent ensuring I am fully involved and up to date. I was impressed when I was recommended Compass as a potential organisation to work with, Holly took the time to meet with me face to face. This ensured a joint understanding of what could be achieved and helped formulate the framework for moving forward together to achieve positive outcomes. Whilst working with Holly I have successfully recruited three excellent managers. Finally Holly is a cheerful, positive and professional individual who always does what she says she will do. I have enjoyed working with Holly and wish her success. Holly has always taken time to understand our business, it’s specific challenges and USP’s, together with what we do well and is likely to attract high calibre applicants. Holly is responsive, helpful and demonstrates that she is keen to ensure we have a long term fit with any successful candidate rather than simply hoping we will go with one of many random candidates submitted, as is too often the experience we have with recruitment agencies.